Subaru announces a new 2017 Outback model. What will the new Touring bring to the lineup? There’s a new 2017 Subaru Outback Touring model coming this summer. The new Touring trim level will be the top-of-the-line for Outback and it gets a bit more comfortable. 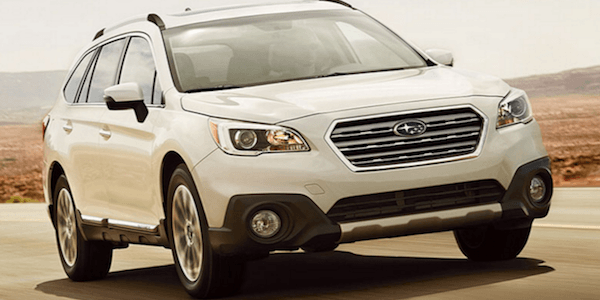 While you can still take the Outback off-road, this Touring model will come with more comfort on the inside. It also gets a new safety feature that will automatically stop the wagon when backing up. The 2017 Subaru Outback Touring is a new model and will be exclusive for the U.S. market. It will be built at the Subaru plant in Indiana and comes with a dark gray grille and machined finished 18-in. wheels with dark gray accents. It also comes with low-profile silver finished roof rails along with lower cladding and chrome Outback badging to set it apart on the outside. A new Brilliant Brown is added as an exterior color option. Inside, all Touring models will feature new Java Brown perforated leather-trimmed upholstery, door panels, and armrests with contrasting ivory stitching. It also gets an exclusive woodgrain interior finish with piano-black switch panel accents. A heated steering wheel comes standard on the new Outback Touring. A new safety feature makes its debut on the Outback Touring. When backing, Reverse Automatic Braking can automatically stop the vehicle if it detects a possible collision. The system uses four ultrasonic sonar sensors located in the rear bumper cover to stop the vehicle when moving in reverse. It also comes with a new High Beam Assist feature. This system works in conjunction with EyeSight to automatically switch the headlights between the high and low settings when an oncoming vehicle is detected. Subaru’s EyeSight driver assist system along with Blind Spot Detection and Rear Cross Traffic Alert are also standard. The new 2017 Subaru Outback Touring model gets a few extras inside for more comfort and debuts Subaru’s auto reverse braking safety feature. The Touring trim comes with either the 2.5-liter engine or the 3.6-liter mill and will arrive in Subaru showrooms later this summer. Pricing will be announced closer to dealer launch.